Yield: Yields four 5-oz. custards. One of the greatest things about this impressive dessert is that you can make the custards—minus the burnt-sugar topping—a couple of days ahead. Of course, you can eat them on the day you make them, too; just be sure to chill the custards for at least 3 hours before topping them with sugar. Position a rack in the center of the oven and heat the oven to 300°F. Fill a teakettle with water and bring to a boil. Put four 5- or 6-oz. ramekins (about 3 inches in diameter and 1-3/4 inches deep) in a baking dish that’s at least as deep as the ramekins. Bring the cream just to a simmer over medium heat. Remove the pan from the heat, cover, and let sit for about 10 minutes. Meanwhile, in a medium mixing bowl lightly whisk the egg yolks, 1/4 cup of the sugar, and a pinch of salt just to combine. Set aside. Lightly whisk about 1/2 cup of the cream into the yolk mixture and stir for about 30 seconds; this tempers the yolks. 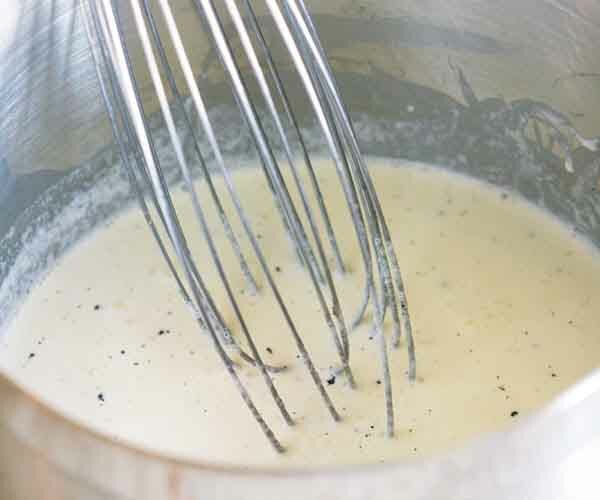 Then gently whisk in the remaining cream, stirring for about 15 seconds to blend. Use a light hand—you don’t want to make the mixture frothy or the baked custards will have a foamy-looking surface. If using vanilla extract, stir it in now. Set a fine sieve over a large Pyrex measuring cup or a heatproof bowl with a spout. Pour the custard base through the sieve to strain out any solids. Divide the custard base evenly among the four ramekins in the baking pan. 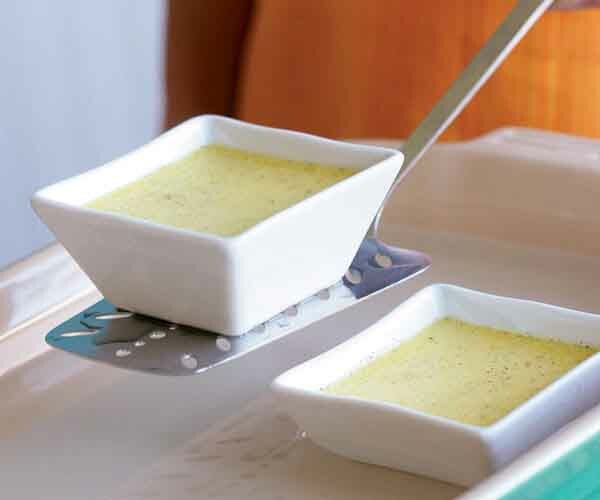 There should be a little more than an inch of custard in each ramekin; it should not come all the way to the rim. Slowly pour hot water from the teakettle into the baking pan (don’t get any water in the ramekins) until the water comes about two-thirds of the way up the sides of the ramekins. Carefully transfer the baking pan to the center of the oven, taking care not to slosh hot water onto yourself or into the ramekins. Lay a sheet of aluminum foil over the pan. Bake the custards until the edges are set about 1/3 inch in from the sides of the ramekins and the center is slightly jiggly (like Jell-O), 40 to 55 minutes. To test for doneness, reach into the oven with tongs and give one of the ramekins a gentle shake or nudge. If the custard responds with a wavelike motion rather than a slight jiggle, it’s not firm enough; bake for another 5 minutes and check again. (If you’re not sure about the doneness, stick an instant-read thermometer into the center of a custard—don’t worry about making a hole; you’ll cover it with sugar later—it should register 150° to 155°F.) The custards should not brown or rise. 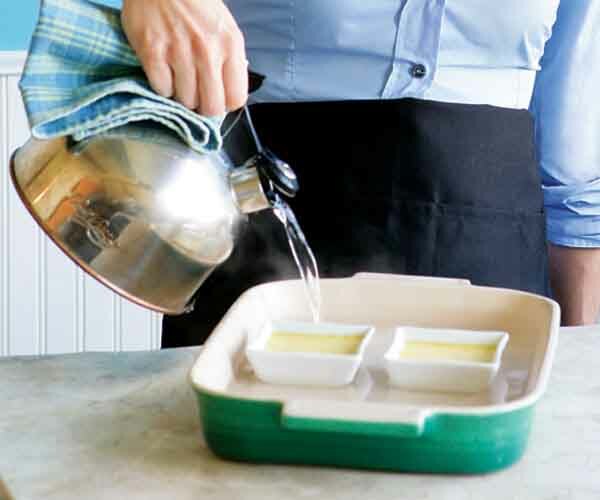 Carefully remove the baking pan from the oven and take the ramekins out of the water bath using rubber-band-wrapped tongs or a slotted spatula. Let the ramekins cool on a rack at room temperature for 30 minutes and then transfer, uncovered, to the refrigerator to cool completely. Once the custards are refrigerator-cold, wrap each ramekin with plastic wrap. Refrigerate for at least 3 hours or up to 2 days before proceeding. Just before serving, remove the ramekins from the fridge and set them on a work surface. Working with one custard at a time, sprinkle 1/2 to 1 tsp. of the remaining sugar over each one—the more sugar, the thicker the crust. 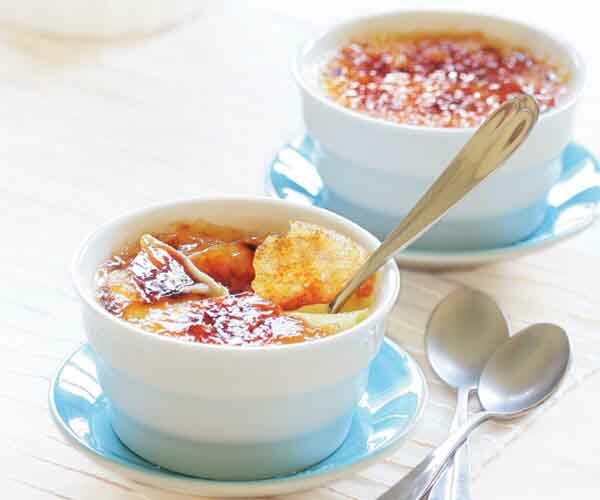 You may need to tilt and tap the ramekin to even out the layer of sugar. Wipe any sugar off the rim of the ramekin. Hold the torch flame 2 to 3 inches from the top of the custard and slowly glide it back and forth over the surface until the sugar melts and turns a deep golden brown. Allow the sugar to cool and harden for a few minutes, and then serve immediately, before the sugar softens and gets sticky. Orange: Omit the vanilla bean and after the cream comes to a simmer, remove from the heat and immediately add 1 Tbs. Grand Marnier or Triple Sec, 2 tsp. (firmly packed) finely grated orange zest, and 1/2 tsp. vanilla extract. Cover and let sit for 10 minutes. Ginger: Omit the vanilla bean (or extract), and instead add 1/2 Tbs. (firmly packed) finely grated fresh ginger to the cold cream before bringing it to a simmer. 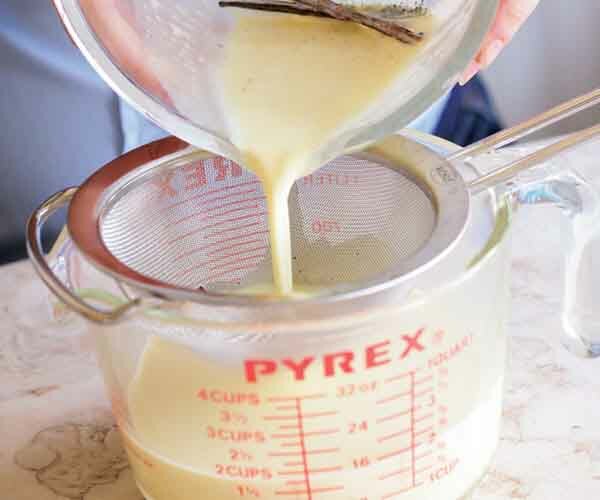 Café au lait: Omit the vanilla bean (or extract), and right after the cream comes to a simmer, remove it from the heat and whisk in 1-1/2 tsp. Medaglia d’Oro instant espresso powder (available from GourmetSleuth.com) until dissolved. Cover and let sit for 10 minutes. Earl Grey tea: Omit the vanilla bean (or extract), and after the cream comes to a simmer, remove from the heat and immediately add 5 tea bags (you may have to prod the bags with a spoon to submerge them). Cover and let sit for 10 minutes. To get great results, you need the right tool: a mini blowtorch. I’ve attempted to caramelize the sugar under the broiler, and although it can be done, I find the process annoying and the results disappointing—the custard tends to get warm, and its texture changes for the worse. I am a big fan of creme brulee; in fact is is my custom that I must order it for dessert if it's on the menu. As my ramekins are only 4 oz, this recipe made six (about 1/3 cup custard per ramekin). Used half a vanilla pod (my second to last one!) and half tsp of vanilla. 1-3/4 cups cream = 14.7 oz. I went out of my way to pick the white thingy off the yolks, purist that I am. Put them in a 9X13 baking pan, and put the pan in the oven before pouring the hot water in. Takes a full kettle to fill up the pan! At 30 min the custard was already above 155 but didn't look set. Left them in for 45 minutes total and then left them in the hot water bath for 10 minutes after taking them out of the oven. Put in fridge for about 2 hours. Used my special stash of vanilla sugar for the brulee. 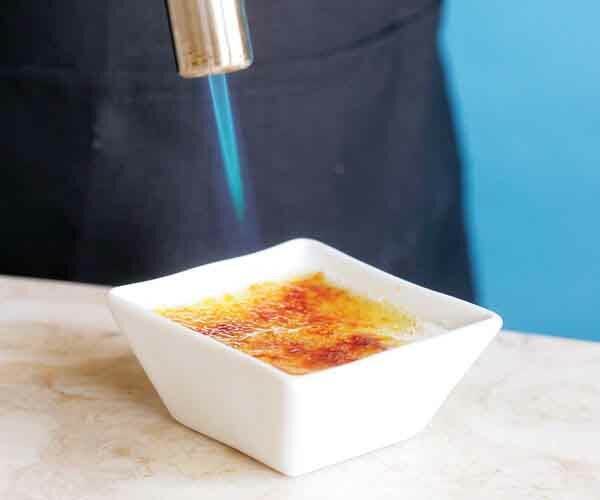 You really need a food torch for the brulee ... I tried to use a BBQ torch, but took forever. All that said, these are the most delicious creme brulee I have ever tasted, even from the fancy restaurants. I'm sorry I waited so long to try this recipe. Five stars.